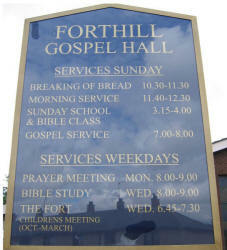 Forthill Gospel Hall, Lisburn, opened in 1979. 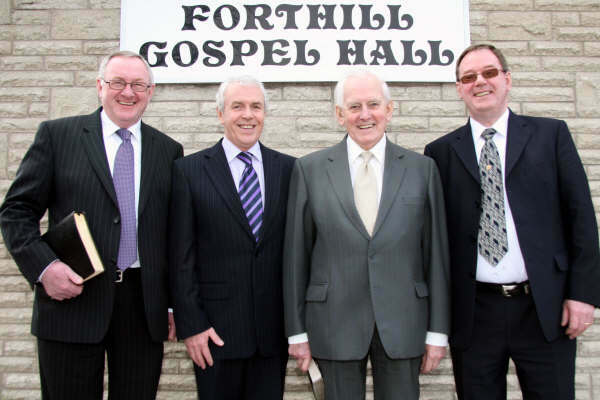 Members and friends of Forthill Gospel Hall Assembly pictured after morning worship in 2009, their 30th anniversary year. In about 1935, a small group of believers started to meet together in rooms called the ‘Central Chambers’ situated in the town square close to where Reid's Shoe shop is currently sited. They met to remember their Lord, to study His word and to reach out with the Gospel. As the years passed and the town expanded it became obvious that a move was required. It was in 1978 that it was decided to move to the Low Road area, and on 21st May 1979, Mrs J. Connor officially opened the new building. 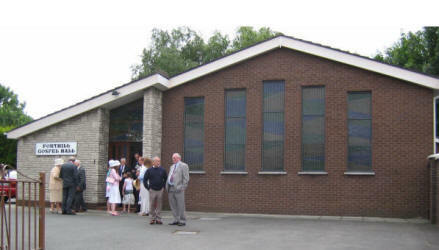 The elders trust that the assembly is a faithful testimony to the Lord Jesus Christ in this area.